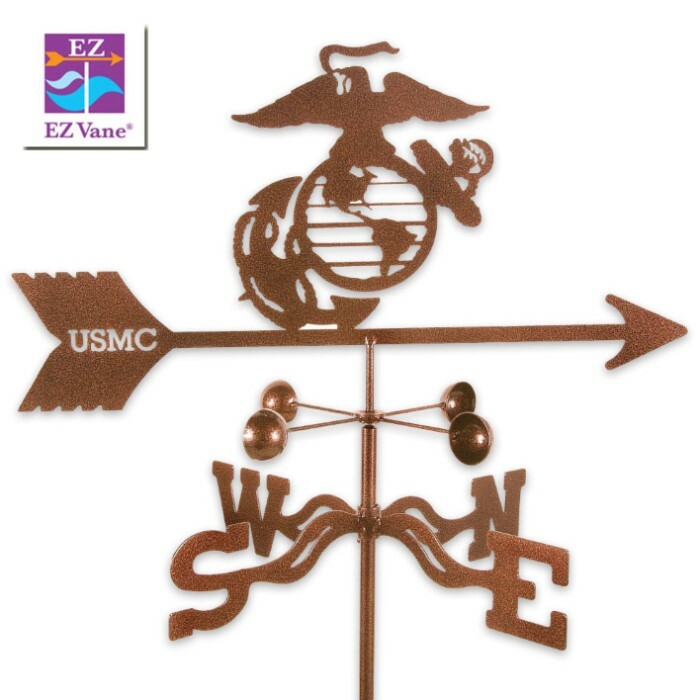 Weather Vane Marines With Garden Stake | BUDK.com - Knives & Swords At The Lowest Prices! Add this exceptional, decorative weather vane to your flower garden or landscaping for whimsical and practical touch your home. It is made of 14 gauge steel that is tough and durable and it has a rust-resistant finish which includes, a process of chrome plating and baking on an antique copper vein powder coat. To finish it off, a clear powder coat is baked on to protect the piece against UV rays, scratching and fading. This is sheer, durable quality in a decorative piece. It also features a sealed ball-bearing wind cup that will spin freely at the slightest breeze. The Marines design topper is a laser cut one-piece process that makes it truly unique. A 60” garden stake is included.